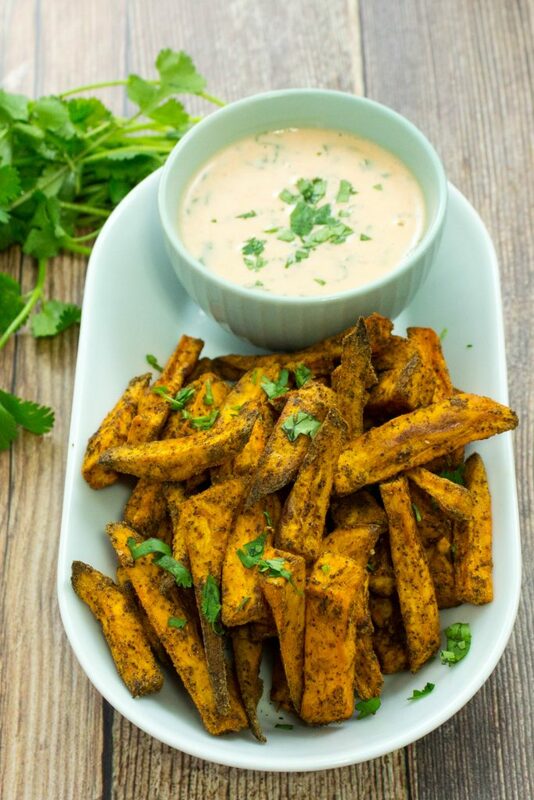 Sweet Potato Fries with Sriracha Aioli is perfectly baked sweet potatoes served with a sweet Sriracha aioli is delicious. 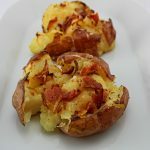 Weight Watchers friendly recipe- 5 SmartPoints! I’ve said this before and I’ll say it again, I LOVE potatoes. Seriously, I could eat them every day. A few years ago, I decided to make a major effort to no longer eat fast food. This is when I started Weight Watchers and knew that fast food needed to be out of the picture, for good! It was hard in the beginning, because I love me some French fries, but as I sit here writing this I can honestly count on one hand the number of times I’ve had fast food in the last 3 years. When I’ve craving my guilty pleasure, I make Sweet Potato Fries with Sriracha Aioli. 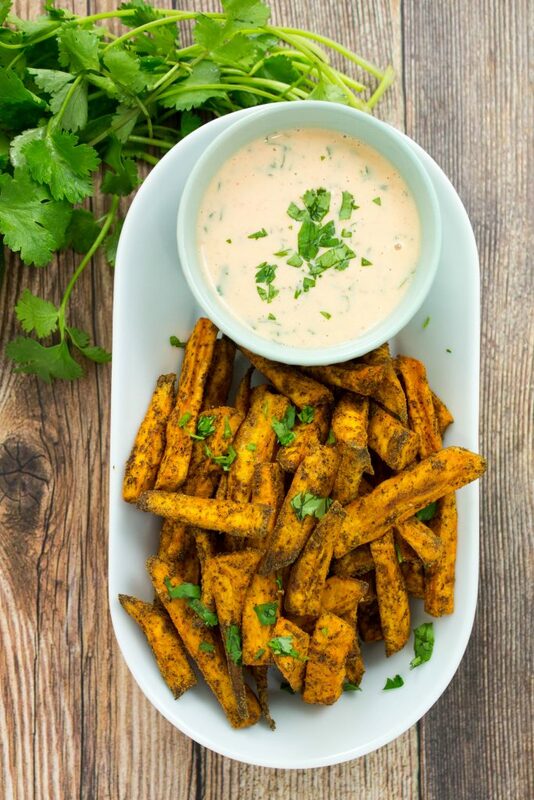 Chili spices coated over perfectly baked sweet potatoes & served with a delicious sweet Sriracha aioli is heaven in every bite. This is a Weight Watchers friendly recipe and each serving is 5 SmartPoints. Every time I am out to eat and I’m faced with the difficult decision to make (regular fries or sweet potatoes fries), I almost always choose sweet potato fries! I don’t know what it is about these potatoes, but I just love them as fries. 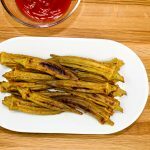 There are so many different recipes for sweet potato fries; my version is a little spicy and served with an amazing dipping sauce. Fries deserve a delicious sauce, am I right?! For this recipe, I coat the sweet potatoes in garlic powder, cumin, chili powder, and salt & pepper. These potatoes are sweet (obviously) so the spices add a really nice flavor to their sweet taste. 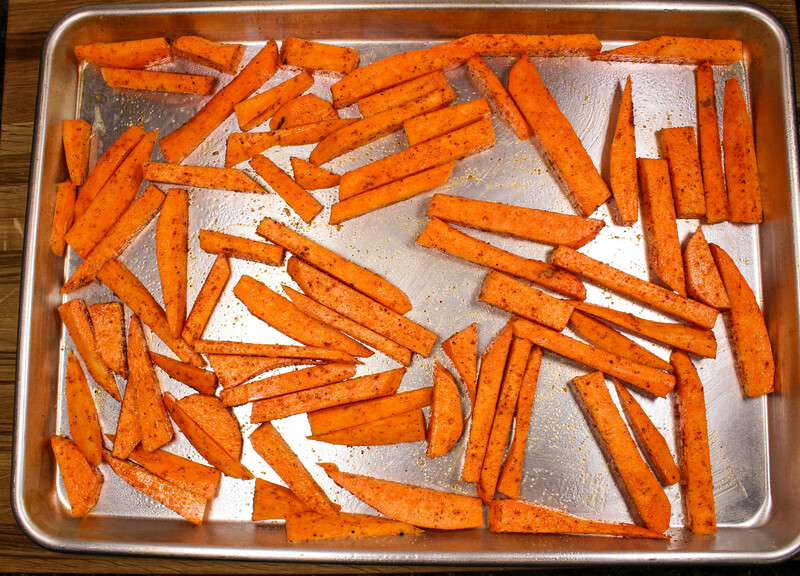 Bake them at 450 degrees on a baking sheet for 20 minutes or more depending on how crispy you want them. 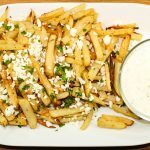 I LOVE crispy food so I tend to bake the fries for a bit longer. The Sriracha Aioli sauce probably deserves a separate recipe post in and of itself. This sauce is awesome y’all and could be good as its own condiment! The sauce is a mix of reduced fat mayo, cilantro, garlic, lime juice, Sriracha, and honey. The honey adds a nice sweet tone that really compliments well with the sweet potato fries. Sweet Potato Fries with Sriracha Aioli are my go to side when I really need my French fry fix. These fries are sweet, spicy, and addictive. Thank goodness sweet potatoes are not a seasonal vegetable so I can make them year round! On another note, I’m happy to say that I can make fries in the comfort of my home, make them whenever I want and eat them whenever I want, without feeling guilty. I can confidently say that I no longer crave or wish I had fast food fries. Thank you Weight Watchers! Sweet Potato Fries with Sriracha Aioli are sure to satisfy your french fry craving. 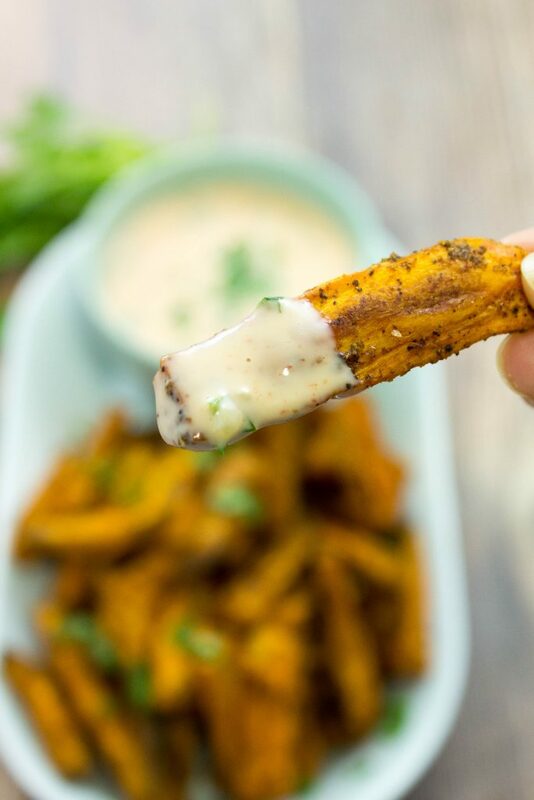 Chili spices coated over perfectly baked sweet potatoes and served with a delicious sweet Sriracha aioli is heaven in every bite! Weight Watchers friendly recipe and 5 SmartPoints per serving! Peel potatoes, and cut into 4-5 slices. Stack the slice and cut into sticks. In a large bowl, toss sweet potatoes with oil, garlic powder, salt, chili powder, and pepper. Arrange potatoes on baking sheet in an even layer. Bake for 25-30 minutes until desired crispness. Toss potatoes on pan half way during cooking. Mix mayo, chopped cilantro, minced garlic, lime juice, Sriracha, and honey in a bowl. Serve with fries. May 23, 2017 at 11:35 am Oh I've never tried juicing but that sounds delicious! Thanks Brittany!! May 23, 2017 at 11:31 am Thanks Kristen! May 19, 2017 at 8:43 am Oh man, that aioli. I'd drizzle it on EVERYTHING! Sriracha is my absolute favorite! 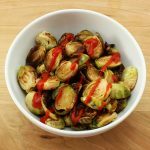 May 23, 2017 at 11:31 am The sauce IS EVERYTHING :) Thanks Divya!